In 4-quart saucepan, place frozen corn-on-the-cob; cover with cold water. Heat to boiling over high heat. Cover and reduce heat slightly. Boil 4 to 6 minutes or until thoroughly heated. Do not overcook. Remove corn from water. Immediately spread mayonnaise over corn. Sprinkle with cheese and chile powder. Elotes con Limon y Chile: Spread 3/4 cup butter on hot corn instead of mayonnaise. Squeeze juice from 2 limes on corn instead of sprinkling with cheese. Sprinkle with chile powder and salt, if desired. 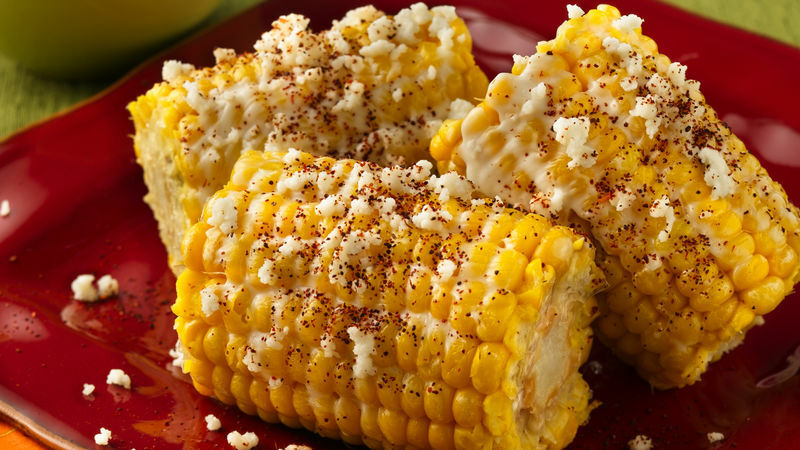 Elotes con Crema y Chile: Spread 3/4 cup sour cream on hot corn instead of mayonnaise. Squeeze juice from 2 limes on corn instead of sprinkling with cheese. Sprinkle with chile powder and salt, if desired.